Cathie had long been conscious of her great grandparents and the family of McKenzies who migrated to New Zealand in the 1870s from Achindrean north of Ullapool in the North West of Scotland. They drove cattle and sheep, and farmed in Apiti and Waipukarau and the Rangitikei. The interplay between the Gaelic speaking McKenzies and Robertsons, and her "English" father from the borders of Devon and Cornwall where horses were bred for the royal family and the old farm house and buildings are still in use, led her in a search which became life-long for relationships and explanations which were easily being forgotten. Cathie herself was born in Morrinsville 9 February 1921, and with her brother Doug was brought up on the farm at Tatuanui, playing near the river, sharing in family occasions on other farms through to Ngarua. She went on horseback to school from an early age and showed an aptitude for books and learning, understanding and remembering things which she disciplined herself to right through life. When she sat her proficiency examination in 1933; the teacher refused to tell her where she came in the class or what the results were, but he did buy her an ice-cream. Sixty years later as a retired school inspector and formidable researcher familiar with archives, she successfully dug out the results from the Education Board papers in Auckland to find out her marks and which boy she beat and why she got the ice-cream. The farm and the family survived the Depression, but the habits of keeping everything in case it might be useful one day never left her. When Cathie had her fall a few weeks ago and I was tidying her room, I forget who it was at Kenwyn warned me about throwing anything away. I have had a life-time of experience negotiating what little I can get away with in that regard. By 1937 Cathie Matthews was going to Hamilton High School by train and had met up with the two Jackson sisters Cathie and Betty - beginning an extraordinary open friendship which was a huge support to each other, and to many many others. It was one of the most stable and important set of relationships in my life. Shortly before her 17th birthday, Cathie received a letter from the Auckland Education Board asking her to consider Training College instead of going back to school for a final year. The family overruled her tearful objections and so joining 300 other first year ATC students her course was set for life. The neat legible handwriting, still impressive at 86, got her the role of writing out monthly allowance cheques. Memories and photographs of the red-headed young woman excited by new adventures still remain, including of a boat trip to Rangitoto. 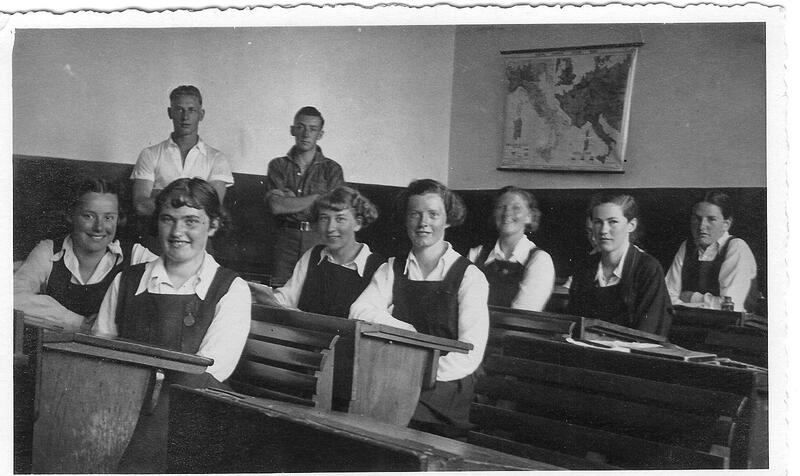 An Infant Mistress on section convinced her that she might like to be a teacher after all and by the time the War had started she was facing a class of 35 students in Morrinsville. After a few short appointments elsewhere she returned for 10 years and the class room in Lincoln Road is still there where she experimented with advanced ideas of classroom management and child-centred learning - to the alarm of headmaster and inspectors alike. Some of you may have been in those classes. During the War years Cathie had met up with the charming Bill Roxborogh, and they were married in the Registry Office at Te Aroha on 4 January 1944 and lived in Lorne Street Morrinsville. I was born 14 months later, but the marriage struggled and Bill had left home by the time I was 4. Many years later it was with Mum's help that I was able to put together the puzzle of the name Roxborogh, and the criminal career of Bill's father whose real name was actually Chapman. It was a story Bill himself knew practically nothing about, but it explained a lot. Cathie could not really cope with Bill, or I suspect for a long time, Bill with himself, yet she made contact with the children from his last and eventually happy marriage, and shared my joy in forming a friendship with Bill's youngest son, Philip and his wife Tania in recent years. Without Cathie, Bill's family and I might never have got to the story of the things which explained so much of the pain they and others experienced. I realise now more of how important the support was that Mum received through these years from Cathy and Betty and their families, and especially from her favourite uncle "Robby" his wife Anne, their daughter Joan, and Tuck and Terry. Joan's husband John was especially important to me in the years ahead. In July 1954 her uncle Bob Scott (married to Alexandrina Ann Robertson, Mum's mother Mary's next oldest sibling) travelled to Scotland and spent a few hours in Ullapool looking for McKenzie relations. He reported that 70% of the population had the same surname so it was hard to narrow the search, but one talked of wishing he had joined those of his family who had gone to New Zealand. A few years later there was the opportunity for Cathie to visit England and Scotland herself and further track down the connections. In 1957 Cathie was appointed as an exchange teacher in England and she and I travelled on the SS Rangitata across the Pacific through the Panama Canal to Southampton. It was a year rich with history, travel, and renewed links with Mum's father's family in Plymouth. When we returned just over a year later through Suez she went to Fairfield primary and I to St Kentigern College. In 1960 Cathie became SJC at the newly opened Hillcrest Normal School; another place I cannot drive past without seeing Mum in her office surrounded by young children sitting on the floor, all of them reading from books, aloud, at the same time. In a few years another adventure beckoned when Cathie received a Fulbright Scholarship which took her to Hunter College New York specialising in teaching gifted children. As she had fallen in love with England, now it was America, though it was not always easy to communicate the sense of excitement to her friends at home. She just missed being at Martin Luther King's famous "I have a dream" speech, and remembers looking after children in school on the day of the assassination of President Kennedy. She seemed to have a knack of being around when things happened. She was there in Wanganui when Snell broke the 4 minute mile. She really was in a plane to Honolulu which saw the re-entry of Apollo 8. Re-entry to New Zealand however was not necessarily easy, but in 1967 she became a lecturer at Dunedin Teacher's College, a year before the main administration building was destroyed by fire. I still have the ODT photo of her wearing a hard hat and sorting through the charred papers from her office. In Dunedin further intellectual excitement came from finishing her BA by her 50th birthday and becoming a grandmother. Cathy Sale pointed out that being a "B.A." grandmother, was a little ambiguous, nevertheless having a grandmother who meticulously tracked their speech patterns for scholarly and teaching purposes did not seem to do either Rachel or Joanna any harm. Both having been born in Dunedin while I was studying for the Presbyterian ministry at Knox College. As a grandmother to all our children, Mum has been outstanding. In 1977 Cathie returned north as a School Inspector. I remember people commenting to me how she would be appreciated by young teachers in their first placements needing encouragement. Fellow inspectors from that time spoke highly of her, and again of her red hair! Jenny's brother Brett remarked to me how observant she was. She was careful, consistent and non-judgemental. She saw the complexity in people, but also their potential. She always took children seriously, and children have continued to gravitate to her as someone who listened to them, believed in them, encouraged them, and remembered their names. Mum's exposure to things Maori was not huge but it was significant. One of my early memories is of the Ngaruawhaia regatta and of visits to Rotorua. She had Maori friends in teaching and at TC. She was pleased with herself meeting Northland School Committees in pubs in the far North, and sitting on the steps of the Nottingham Castle Hotel talking with other old kuia after a tangi. She saw through the unconscious racism of pakeha legal process. Just last Saturday she picked up the paper and saw a picture of Tame Iti. "Ah, Tame Iti. I think they are being a bit rough on him. I would not mind if he came to live in my street! Then I would feel a bit safer!!" Cathie was furious at having to retire after 40 years service before she was 65, but Morrinsville became her home again and proved its value as an extraordinary caring community. She ran a stall for World Vision, even if it could not keep up with input from other people's garage sales. Her friendship with others in Park Street, the Browns next door, Pat Allison down the road, Barbara Carey on the other side, and Helen Stone a fellow traveller in the adventures of genealogy became deep and occasionally mischievous. Gradually Tony Tissing worked miracles and renovated the house. She worked on the garden and on the family history. Her work in making the connections led to a remarkable family reunion in Feilding, and if anyone still has not got a copy of the cookbook let me know! After 1992 she was not able to drive again, but the exercise and sociability probably saved her life. From time to time she would confess that she had adopted another cat, and her 4 well fed tabbys were definitely on to a good thing. By 2003 various aches and pains started to get to her but to her disappointment Dr Fay refused to prescribe marijuana and put her on prednisone instead. After several spells in Rhoda Reid Hospital Cathie tearfully accepted that the time had come to move into care. During 2004 Barbara, Allison, Kathlyn, Leonie, Peggy and the other staff at Kenwyn did a heroic job of getting her through the months of feeling sorry for herself. The grief at doing what was not in her plan focussed on the one cat Camy that came with her and then ran away. But one day the grief was gone. Friends and family, Desma, her brother Doug, Pat, Lorraine, Dorothy, Leijn van Wijk, and Helen Stone up occasionally from Ashburton, the Hope Family from Hamilton, are only some of the many people who visited and kept returning. Her annual birthday parties at Mokena Restaurant in Te Aroha were great family occasions which she loved planning. She rang up frequently to confess she had invited someone else to add to the list and to ask with guilty pleasure whether "we" had enough money and whether there was enough room for them all. When I visited Kenwyn and Mum wanted to go out, often it was to Te Aroha Cemetery where many of her relatives lie, including her beloved brother, Doug. When Betty died earlier this year, Mum managed the trip to Auckland. I was not sure of her own intentions about what she wanted to happen when she herself died, and I took a bit of risk to put the question: "Well Mum, what about you? Do you want to be buried or cremated?" She replied: "preferably neither!" - I took that as a preference for burial.